I have spent the past 3 years teaching coding in my middle school class. I started my journey in coding with absolutely no coding experience. I remember in college I had a friend that took a business class where they had to create a resume using html. I was so impressed and wanted to learn, but alas never did. I taught myself basic css and html by reading books and had units of this about 10 years ago in an 8th grade advanced computer class. But I wanted to go further than html and css and explore other computer languages, but I didn’t have the resources to learn more on my own (fast forward another 7 years). In 2011, I did the week of code with my students from Code.org. 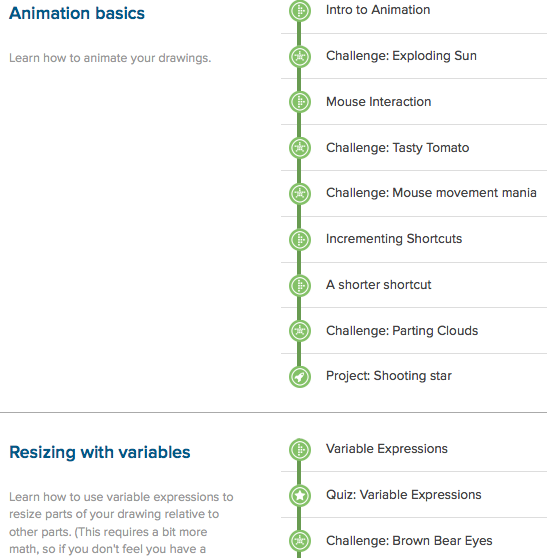 It’s a really great intro to coding and perfect for beginning this journey into code. My students loved it as it’s very animated and fun. For them they feel like they are playing a game. It uses blockly and utilizes great videos and high interest characters like Angry Birds. 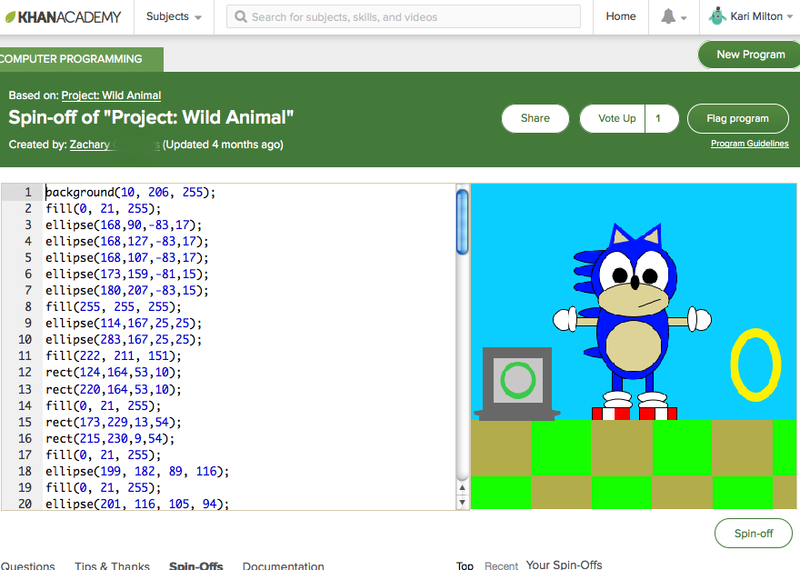 While great for 6th grade learning, I wanted to have my older middle school students actually write code…. Ironically he was horrible at math. Close to a D average in fact! How could such a brilliant boy be bad at math when he obviously gets deeper math understanding and logic. He had a disconnect between math and what he likes to do and no teacher had yet to understand his interest in code to help him relate his favorite pasttime with the school subject. Khan academy is a fabulous open education resource. You can use it for a wide spectrum of education skills. But as a computer teacher the computer programming component is of my value in my curriculum. 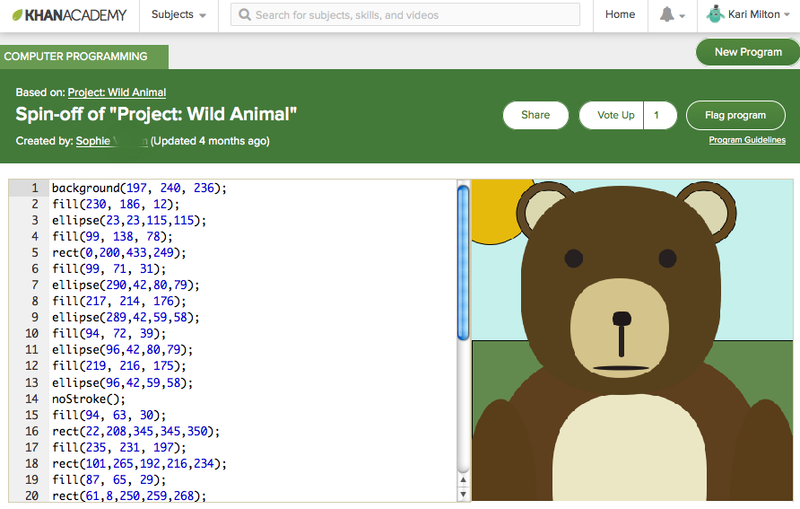 It has the most amazing platform to engage students and teach coding. Like codecademy it brings students through lessons and incremental steps, there are also project built in called Challenges. What makes it better is hands-down the videos. The videos are kid friendly, yes… But most importantly is an advanced feature that they have in their videos. At any time you can pause the video and manipulate the code in the video. So if the video says to make a rectangle rect(30, 20, 100, 35); You can pause the video and now you can play with the code on the screen. I could change the 30 to 300 and learn that the first number changes the x position. If I changed the 35 to 45, I will learn that it make the rectangle get taller. The ability to manipulate the video is incredible to learning. Thank you so much for sharing your journey of growth and learning. It is inspiring to hear not only that you learned to code, but that you have now creatively found a way to get kids into coding. Teachers like you demonstrate what it means to LEARN. You are an autodidact, you proved that by teaching yourself, but again, modeling that is powerful for kids and not routine or perfunctory teaching. I’ll keep watching, and am now on my quest to code! I’ve been spending a lot of time recently studying about growth mindsets and your story of struggling with remedial math in college and transforming into a math teacher is very inspiring. I appreciate your comment, especially knowing what an accomplished learner your are! You obviously demonstrate what it means to LEARN as well, and if you need any help or pointers on your quest to code, please contact me! I just love to LEARN, and like to support teachers as best I can!